So, I am super excited to be attending this years Longview Literary Festival. The festival is located at Metropolitan Community College in Lee’s Summit, Missouri. I found out about this festival through my friend, Amy. Thanks, Amy! The first thing I’ll be doing is participating in a panel discussion about writing short fiction. So far, the schedule shows me being joined by one other panelist. Hi, Sean Demory! My panel runs from 11:00pm to 12:00pm. After that, I’ll take some time to sign some books. My table is tentatively open from 12:00 to 2:00. I’ll try to not disappear for lunch, so you might find me eating while signing books. 🙂 I’ll be trying something new: selling my books at whatever you’re willing to give. So one dollar or a hundred dollars; I’ll take as little or as much is offered in exchange for a book. If it goes well, I might try it again. I will also be doing a reading at some point during the day at one of the open mics. As far as I know, I don’t have any fans traveling down to see me (if you are planning to, shoot me an email at wintergreenwriter@gmail.com and I’ll be sure to set my sights on one open mic slot). The most likely reading time for me is between 5:00 and 6:00. I have a lot of material for public readings (hint: email if you want to book me as a reader for your literary event). It’s going to be a Friday for enjoying readings, attending panels, and making friends. Speaking of friends, I’ll be traveling with my friend Mike. Thanks Mike! Not that I left him much choice in the matter. 🙂 After all, I needed someone to lug around my copies of Descriptions of Heaven. 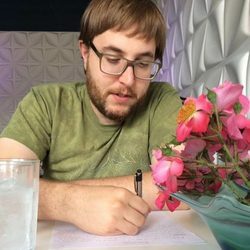 On May 18th I did a reading and book signing at Sioux City’s Blue Cafe. The owner, Gia Emory, told me that we packed the house. Teniesha Kessler was our featured poet, giving us a variety of poems—wild, weird, and wonderful. One of my best friends in the world, Chris Larson, provided us with some classy piano jazz both before and after the reading portion of the evening. While Chris played his tunes for us, I got to sit on stage and sign books. I read stories, poems, and even a bit of creative non-fiction about my blind little pooch, Missy. Of course I read from Descriptions of Heaven too. Blue Cafe also houses the music studio of Ron Emory from T.S.O.L. He couldn’t make it to the show, grieving the death of his good friend, Chris Cornell of Soundgarden and Audioslave. I did see Ron earlier in the day and was able to wish him an early “happy birthday.” (Cool fact: we share a May 20th birthday). My wife Libby and I having our photo taken after the show. We were also celebrating my birthday that night. Gia surprised the patrons with free cake I had her make for the occasion. Afterward, some of us went out for drinks at the nearby Diving Elk. My gorgeous wife got herself an old fashion, and I had a couple of tasty dark beers in celebration. Join us May 18th for a reading from local Sioux City author Randal Eldon Greene. He will be joined by Omaha poet Teniesha Kessler. Party starts at 5:00pm and ends at 9:00pm with the piano jazz stylizations of Chris Larson and Ben Lunn. Copies of Randal’s novel, Descriptions of Heaven, will be on sale for $20. No need to RSVP, but you may let us know if you plan to go through this Facebook Event.